Our Portobello mushroom low carb pizza is an excellent choice for a meat-free day. This is a delightful combination of flavors and tastes that takes pizzas to another level. We use fresh basil from the garden and extra-virgin olive oil to make this all-year favorite. I made this pizza countless of times for my kids' birthday parties and weekend lunches. And this vegetarian recipe is just perfect if you try to cut back on meat. It offers plenty of crunch and the ingredients blend just right. 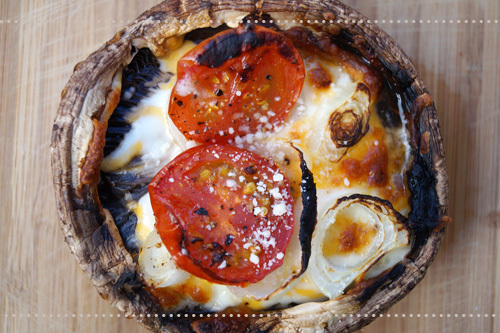 This cheesy Portobello mushroom pizza tastes so good that it makes you splurge. Scrape the gills and remove the stems. Season the caps with salt and pepper and drizzle with a little bit of olive oil on each side. Broil the caps for 3 - 4 minutes on each side. Set aside to cool. Mix mozzarella with cream and combine well. Sprinkle basil and mozzarella onto each Portobello cap. Add cherry tomatoes on top and finish with Parmigiano. Preheat oven to 350 F (180 C) and bake for 15 - 20 minutes or until the cheese has melted. Optionally, you can add red onion, black olives, and sweet peppers. In this case, use 1/3 cup of sliced sweet peppers, 1/3 cup of sliced olives, 2 tablespoons of minced red onion, 1 cup of cherry tomatoes, and 6 ounces mozzarella. Broil the caps and top with red onion, peppers, olives, tomatoes, and the cheese and cream mix. Bake for 15 - 20 minutes. Sprinkle with fresh basil and Parmigiano and serve.